My six-month old enjoys playing with this. 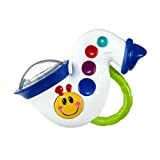 Rattle+Music: It’s nice that it has both the rattle and the music-the rattle will keep babies entertained even when they’re not able to turn the music on themselves. Nice Music: This has nice quality music that isn’t too annoying for parents to listen to over and over again. It plays 4 classic tunes when the yellow caterpillar button is pushed. Easy to Hold: This was easy for my son to pick up and hold on his own. Fun Mirror and Beads: The end of the saxophone where the rattle is has a mirror on it and is covered in clear plastic so you can see the colorful beads rattling around. This is fun for babies to look at. Only One Button Works: The only button that does anything is the yellow caterpillar button. I wish that all of the buttons worked. Colorful Button’s Only on One Side: The colorful buttons are only on one side of this. The other side is just plain white plastic with indentations where the buttons would be. I wish it had the buttons on both side. It was a lot smaller than I had thought of, but nonetheless my son enjoys playing with it constantly. For the price is a decent toy. My baby boy loves this toy, I just wish it has more than one button for him to press. But it is great for little hands, plays music to enhance hearing, and its a rattle as well. It’s colors also stimulate vision.